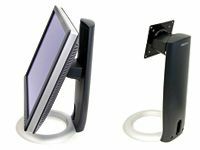 More on the Ergotron Neo-Flex Adjustable Desktop Stand for 8-20 inch Screens 33-310-060 below. Patented CF (Constant Force) lift-and-pivot motion technology for easy and reliable fingertip adjustment. 5" vertical adjustment for enhanced viewing and ergonomic monitor positioning. 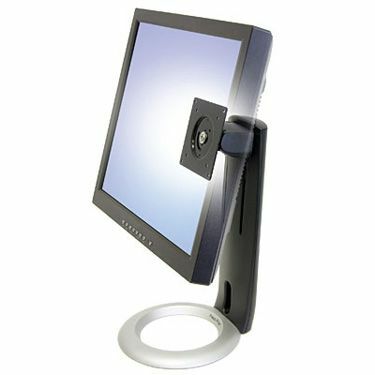 A universal design, accommodating various LCD sizes up to 20 inches. PLEASE NOTE: Weight capacity may be reduced if monitor is more than 2" in depth. This product conforms to UL specification 1678 tip-test when loaded with all weights of LCDs. It also meets the European TCO-03 certification label and the Physical Ergonomics Standard.